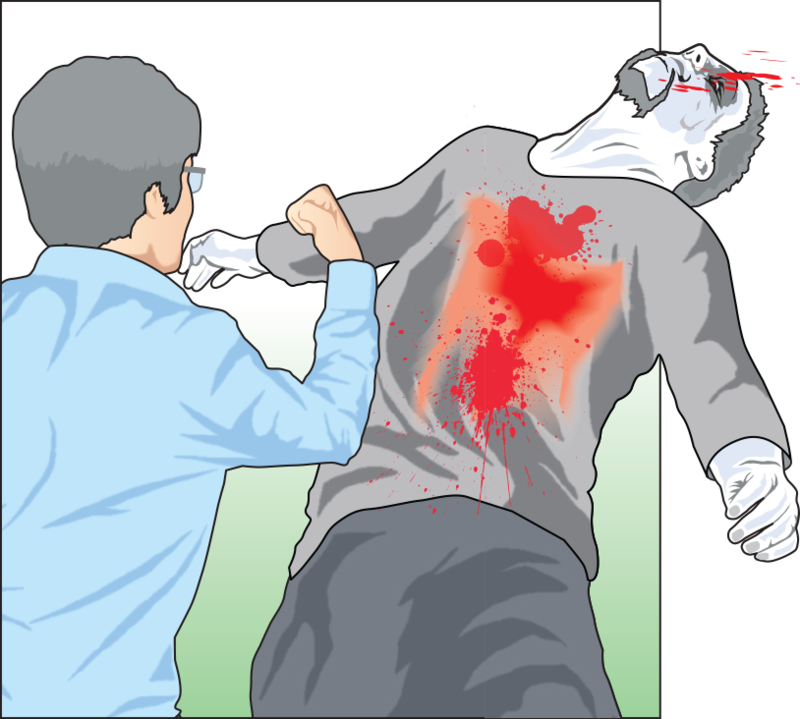 There are some important differences when facing a zombie in unarmed combat and those experienced in martial arts or self-defence sometimes struggle to fully grasp this rule change. To be clear, traditional combat techniques used against the living need to be adapted for use against the walking dead. In general, the martial arts and any intensive fitness training will provide a good foundation for unarmed combat against zombies, but it is often the case that experienced martial artists do not appreciate the great difference between battling a living opponent in a training dojo and taking on several ravenous zombies on a street corner. Vulnerable points on a human, such as solar plexus, groin or bridge of the nose are not appropriate to zombies who have no feeling in these areas. A classic low karate kick may work to disable a living opponent but against zombies it will send the ghoul forward, its jagged nails outstretched. The most likely outcome is a ‘raking’ by which the dead drag their infected nails down you as they fall. The dead obey no rules other than the one that makes them want to feast on your flesh. Some martial artists come from such a disciplined background that they forget a zombie has no honour and feels no mercy or pain. However, a kick to the knee or gouging of the eyes can still ‘damage’ a zombie’s movement or sight. Just be aware that pain and any disability will have no impact on the dead’s desire to feed on the living. If these walking corpses get the chance, they will munch down hard on your flesh. Classic self-defence and martial arts holds rely on leveraging an opponent and using pain to restrict their movements. Few of these techniques will work on the dead. If you have been trained in any combat techniques, the best advice is to forget what you have learnt. Many traditional moves will be suicidal against the dead. There will be occasions when blocking is simply not enough. You may need to seriously impair or damage your attacker. 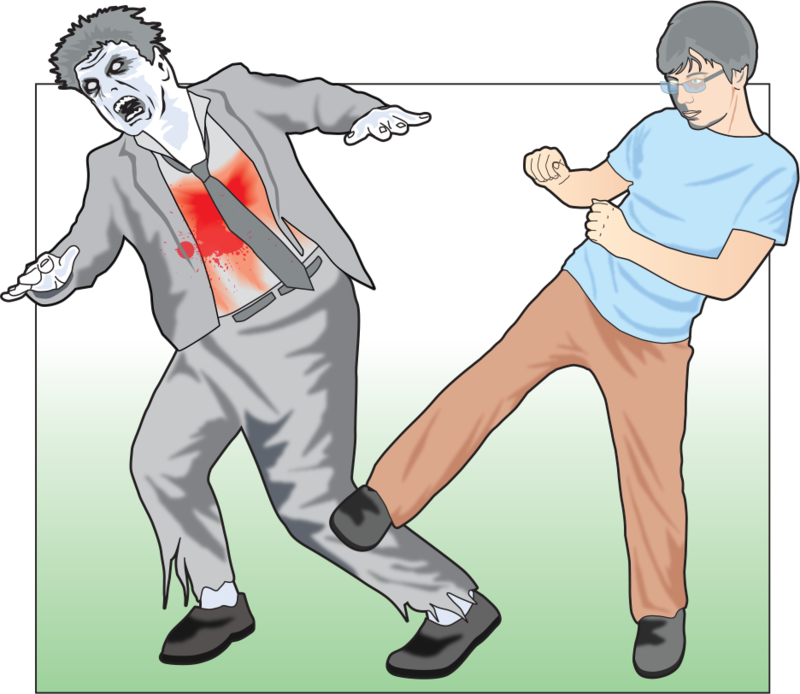 There are four basic moves in a typical zombie self-defence programme: the Queensberry blast, the upper cut, the ‘Captain Kirk’ and the low knee kick and dash. Three of these moves are made using the arms as they are traditionally the easiest for beginners to master without losing their balance and are most instinctive. We start with a variation of the standard punch which is a core move in any unarmed combat defence programme. The fighter must adopt a classic boxer stance, with one leg slightly forward. The Queensberry Blast is a natural combination of two jabs to the upper half of the zombie head. The punches should land in rapid succession and it is likely that the force will lead the corpse to stumble backwards. 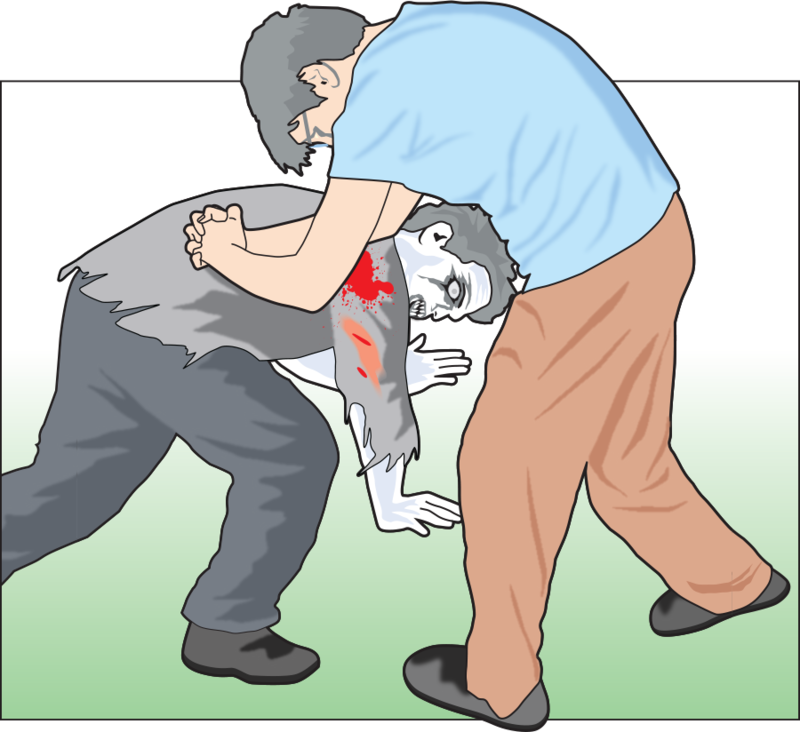 It is a low-energy move that can be useful where the fighter lacks the strength to take out the zombie with one punch. Similar to a standard punch, this upward sweeping blow can prove fatal to a zombie when delivered with enough force. The user shifts onto one side, swings an arm back and delivers the punch directly underneath the chin, forcing the corpse’s head to whip back. It can be a powerful punch to disable a zombie with, but sometimes it leaves the dead with a shattered row of sharp teeth – something they will be thankful for as it makes it easier to pierce through living flesh. Supposedly taught to William Shatner by an ex-Army Ranger stuntman, his trademark double-handed punch is particularly effective against the dead when delivered from behind. With force and making contact with the mid-back section, it will drive the zombie face down to the ground, making for an easy stamping target. 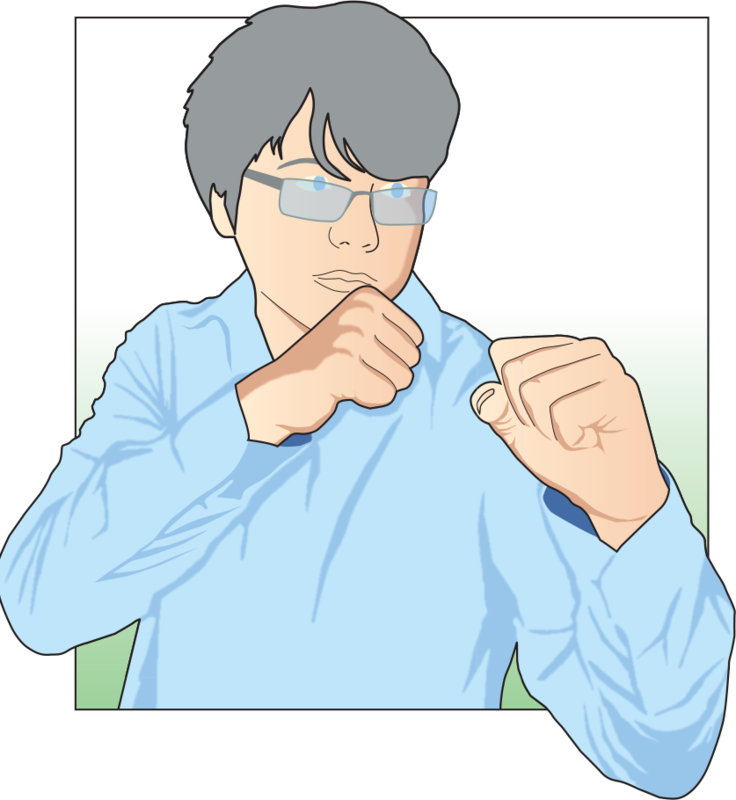 Delivering a double-handed punch to the front is similar but involves whipping the hands out of harm’s way much quicker. Shatner himself always preferred two punches, one to the middle then a knock down to the back of your opponent. 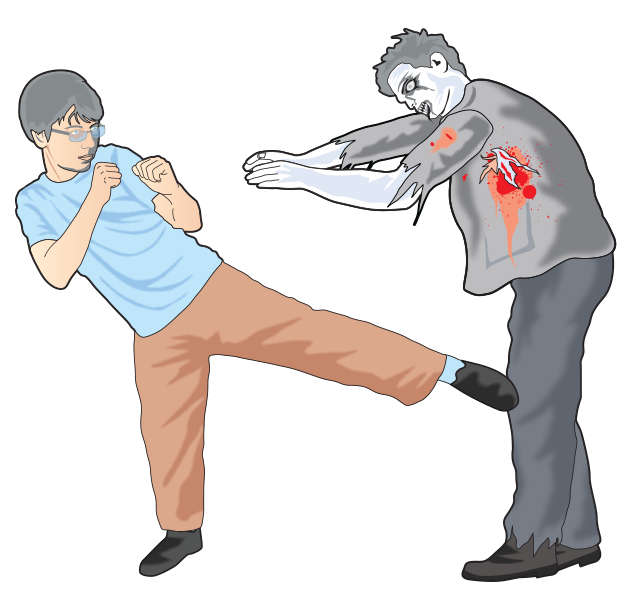 The most useful move in combat against the undead is the low knee kick, which will temporarily disable the zombie and enable you to make your escape. The move is most effectively delivered when the kick strikes the side of the knee, almost in a stamping motion. Be especially wary of the corpse’s direction of fall and remember that this will not disable the ghoul’s snapping jaws. This move will leave an active crawler behind even if you manage to shatter the knee joint. Remember, this is not a kill move – it’s a basic move designed to give you time to make a run for it.